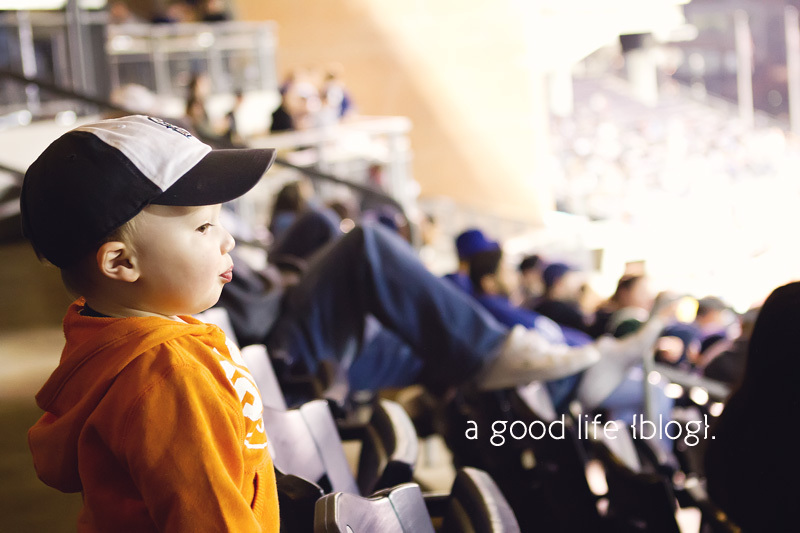 a good life. : hey parker... it's your birthday! but we're postponing further celebrations. i know, i know... not fun! today you're sick, little monster. i can hear you coughing back in your bed as i type this & it makes my heart hurt to know there's not much more i can do than turn up your humidifier, rub vicks on your feet & hope for the best. but don't worry... we've already done lots of fun things to celebrate! 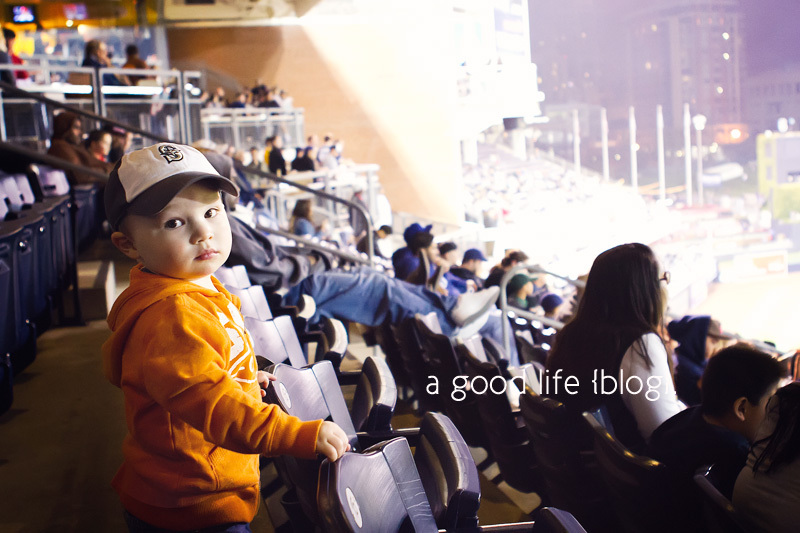 we took you to a padres game while we were in san diego & you had so. much. fun. you clapped & cheered & waved & walked around the whole entire stadium all by yourself. you were in awe of the lights & the stadium organ & you kept yelling out "baseball!" when you looked at the field. an usher thought you were cute & gave you a little plush baseball with the san diego padres "SD" logo on it. you spent the rest of vacation holding on to that baseball & taking it everywhere you went. heaven forbid you lose sight of it for five minutes! your mom & dad love watching you have fun, parker. we stayed for fireworks at the end of the game & a week later, you are still talking about them. "see fireworks! boom boom boom! baseball!" you are such a fun little boy. and today you are two. two years have gone by since we met you face to face. two years of holding you in my arms & calling you my baby. you've made me happy beyond anything i ever thought possible & continue to do so everyday. you're my little boy & even though you get bigger everyday & will someday not fit in my arms or on my lap, you'll always be my little boy. and now you get to be a big brother. i can't wait to see you with your little brother... you're going to have so much fun with him. you love babies & think it's so funny when they do anything. i'm so excited for you to meet him! we love you so much parker & can't imagine our lives without you. actually, we can't even remember what life was like without you... it must have been so boring! our lives as a family of three began on this day two years ago & nothing has been the same since. thank you so much for being such a good little boy & giving us the best two years of our lives. I just told ruby that it's another baby's birthday while I was reading this and she pointed at the picture of Parker and said "whoa!" so, apparentally she's pretty amazed and excited for him. :) hope the birthday boy is feeling more like himself soon! Happy Birthday to your little man! Hope he feels better soon! This made me cry! Parker is such a fun little boy with so much personality! So happy I get to watch him grow up. This was so sweet, happy birthday to your little guy! I'm so sorry that Parker is sick!! That stinks! Nothing worse then sick kiddos. Hope he gets better, soon!! But seriously, Happy Birthday to Parker!!! Can't believe he's TWO! Aaaah! And what a fun thing to do to help celebrate his special day-- baseball games are THE BEST! Happy Birthday to the little monster! This is a sweet post; I'm sorry he is sick. You have some great shots here though! Happy Birthday to him- looks like a great way to celebrate! Happy Birthday Parker! :) Get to feeling better! oh happy birthday Parker!! Hope you feel better soon!! Such a wonderful post!! loved what you wrote, so sweet!! Happy Birthday precious Parker! Hope you get to feeling 100% very soon. That Padres game looked like so much fun. I just know there are some Mariners games in your future!! i hope he gets feeling better. sick kids are the worst. looove the part about him still being your little boy. i think the same thing every day. dane will always be my baby. it's like that 'love you forever' book? i cry sometimes when i read it...anyway, happy birthday, parker! Happy Birthday Parker!! You little cutie! Happy Birthday Parker! Sorry you aren't feeling so hot today :(. Parker!!!!! Happy birthday!! I can't believe youre 2. Holy cow! I hope you feel like your crazy self soon. If not, we can celebrate next weekend and party with lots of cake and playdates at the park. Dont tell your parents, they'll be super jealous. Shhhhh! Happy Birthday, Parker! So sorry he's sick on his special day. Sending get well wishes! Happy Birthday, sweet parker! I hope you're back to your old tricks soon, buddy!!!!!! YAY! Happy birthday, Parker! What cool parents you have, to take you to a baseball game! Hope you feel better soon so you can celebrate some more! Happy Birthday Parker!!!! And seriously, another baseball game? We are taking the twins to one this summer, but only for teh last couple of innings. I can't believe he is ok! Happy Birthday, Parker! Such a beautifully written post for such a sweet little boy! Hope he is felling better very soon! Happiest of birthdays, little Parker! Two! That's crazy, it seems like he was just turning one! Little ones grow so quickly :). Happy Birthday to your big boy. Happy Birthday big bro. P-ray!! Such adorable photos! Hope he had a great birthday even though he wasn't feeling well. Can't wait to bring my little guys to a few baseball games this spring and summer. 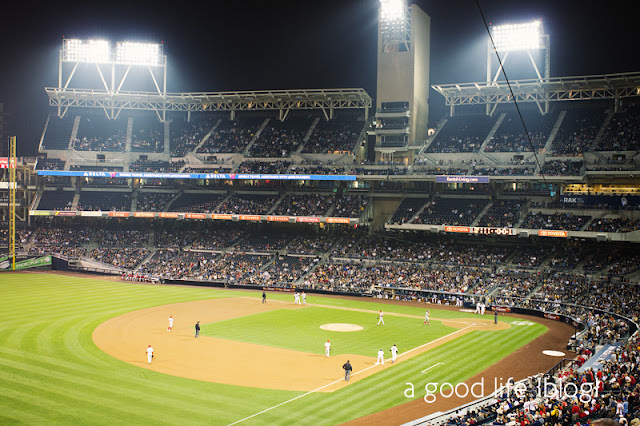 I've been to the Padres stadium many years ago, such a great stadium. Happy belated birthday to my birthday twin!